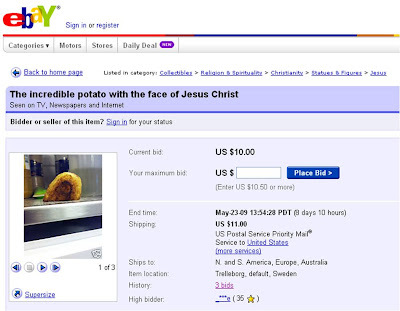 Swedish newspapers have been covering developments regarding the 'Jesus Potato' on Ebay. But after 7 days of bidding (and significant Swedish press coverage) the Swedish Jesus Potato stubbornly remains at $10.50. Hard to know what this results from - is it that novelty items are no longer newsworthy or that the credit crunch is pushing down the price of holy foodstuffs too? Or, most likely, the advent of social media is creating far more opportunities to generate (long lasting) noise and brands now hope for more than creating a short term spike in buzz by buying something silly on Ebay? The country of Belgium for sale on Ebay!